New Melbourne Browncoats, Inc. | The winner of our Adam Baldwin Trivia Competition is…. A HUGE thank you to Melbourne Browncoats, Supanova & Adam Baldwin! Pre-ordering for our Can’t Stop the Serenity 2013 merchandise ends today, so head to our Store to order yours! Thank you to everyone who entered our Adam Baldwin Trivia Competition! It seems that we stumped a few of you on some of our questions, but the power of the verse prevailed for the lucky winner. Congratulations to Helen of Parkdale VIC!! Question 1: How many Jayne hats were made for the filming of Firefly? Question 2: In Chuck, which item in Casey’s apartment was added by Adam from his personal collection? Question 3: Name the character and episode in The X-Files where Adam said the line “I’m second in command. I’m supposed to know the ship, Sir. In case something should happen to you.”, and which character he was speaking to. Question 4: In Angel, what was the name of Adam’s character, and what was he the guardian of? Question 5: In The Inside what drink does Special Agent Danny Love order at Dugan’s in Episode 5? 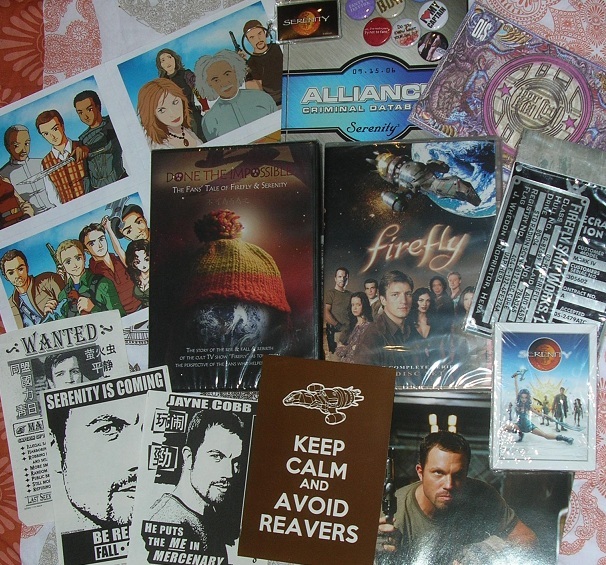 Helen has won the DVD set of the complete series of Firefly, a copy of Done the Impossible, an Adam Baldwin picture, a replica 10 credit note, a hard-to-find keyring from the US promotion of Serenity, a set of Stewart McKenny gift cards, an Alliance Criminal Database booklet and a collection of verse inspired stickers and badges.